Launched nearly 30 years ago, the Voyager 1 space probe is now 100 times further from the Sun than Earth is, some 15 billion km away. With its twin Voyager 2, it is set to go past the edge of the Solar System, where no spacecraft has ventured before. How old were you in 1977? Maybe you weren’t even born yet. That summer, 2 powerful Titan III Centaur launchers sent the Voyager 1 and 2 probes on their way to their initial destination, the giant outer planets of the Solar System. Their goal was to discover these strange worlds with atmospheres continually buffeted by storms that would be capable of swallowing Earth whole. The Voyagers have revealed the incredibly complex diversity of the Solar System, doubling the number of known moons around the giant planets and creating the spark for the Galileo and Cassini-Huygens missions. What has it found there? 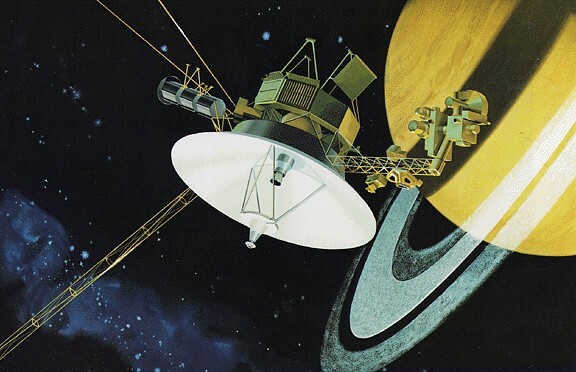 The Voyagers’ longevity so far from the Sun is down to their radioisotope thermoelectric generators, which produce electricity from the slow natural decay of a radioactive plutonium 238 heat source. This system enables the spacecraft to regularly beam data back to Earth. The signal from Voyager 1 currently takes nearly 14 hours to reach us from the edge of the Solar System. So what has it found there? With help from its twin Voyager 2, it has shown that our star’s magnetic field forms a giant bubble and that an interstellar magnetic field is pressing against it in the south (where Voyager 2 is now). Due to this extrasolar magnetic field, the heliosphere—the bubble created by the solar wind—is not a perfect sphere but rather an elongated balloon shape pushed in at one end. When will the Voyagers reach the final frontier of interstellar space? This frontier can be pictured as the surface of a rough sea with big waves: the Voyagers are emerging from the depths of this sea and are now right near the surface. But sometimes they find themselves at the foot of a wave, in the “open air” (interstellar space), and sometimes under the waves (still inside the Solar System). According to Nasa’s scientists, this turbulent crossing could last another 10 years before humankind’s most distant envoys leave the Sun’s zone of influence for good.